“The most difficult subjects can be explained to the most slow-witted man if he has not formed an idea of them already; but the simplest thing cannot be made clear to the most intelligent man if he is firmly persuaded that he knows already, without a shadow of a doubt, what is laid before him” (Leo Tolstoy). Have you ever read a book a second time only to discover something new that escaped you the first time? New meanings emerge, but the book is the same and you are looking through the same eyes. What’s different? Over time, you had a vast array of new experiences that altered your horizon of understanding, generating new interpretative possibilities and evoking fresh insights. What changed is your perspective. When talking about the Bible, some people argue the contrary. They claim to have easily discovered the correct meaning of a passage with a simple, literal reading. No interpretation is necessary, only common sense. “Look!” they say, “The meaning is plain as day, right there in black and white.” But this naïve, uneducated, and highly personalized approach is shallow, misguided, and dangerous. To the contrary, hermeneutics helps us understand that the meaning of a text (including the Bible) is not an objective fact waiting to be discovered like a quarter under a couch cushion. Rather, meaning is something that is created when our minds interact with a text. Simply put, meaning is an event. Since the meaning of a text emerges through the application of a particular perspective, it is important to remember that our perspective is always limited. So what shapes our perspective? An extensive list is beyond the scope of this article, so a few general examples will have to suffice. First, we might consider how a wide range of formative experiences in early childhood influence how we see the world, especially in our family of origin. It would also include our education, both secular and religious, and how this influences our views on things like politics, morality, and religion. Our perspective is also shaped by the way we see ourselves and others in relation to gender, race, ethnicity, socio-economic status, age, and sexual orientation, as well as the way the dominant culture interprets and assigns value to such identifiers. When it comes to interpreting sacred texts, our past and present experiences in a community of faith will generate various “pre-understandings” that must also be taken into account. For example, before we ever start reading the Bible on our own, most of us begin with a particular image of God and a wide range of assumptions about what the text could possibly mean and how it should be interpreted. These pre-understandings usually come through the inculcation of religious traditions in a specific community of faith, but they can also be acquired through the absorption of cultural stereotypes. Regardless, these pre-understandings serve to highlight and privilege certain interpretive possibilities, while obscuring and repressing others. The main point is that a wide range of continuous experiences generate innumerable interpretive filters and pre-understandings that come together to create a person’s limited perspective. This perspective provides a world-view that functions like a pair of glasses through which we see everything, including our sacred texts and traditions. When different perspectives interact with a text, different meanings emerge. So, a twenty-three year old Columbian woman living in extreme poverty will interpret the Bible differently than a wealthy, white, fifty-five year old American man. They will focus on different passages and, in some cases, discern divergent meanings. Since meaning is an event that happens when different people’s perspectives interact with a given text, multiple meanings are possible. Texts are polyvalent. While we are not entirely enslaved to our own perspectives (see below), no one can achieve a perspective-less God’s eye view. This does not mean that interpretation is a free-for-all in which we can make a text say anything we want. When it come to the Christian Bible, there are interpretive boundaries established by the community of faith, by the academic disciplines of Biblical studies and theology, and by common sense. But firmly grasping the role of perspective in the event of meaning and the polyvalent nature of all texts will help keep us humble in our interpretation. One of the biggest dangers for religious people is forgetting that they are reading with a pair of interpretive glasses, that they are reading through a worldview constituted by a complex set of interpretive filters and pre-understandings. If we are not even aware that we are interpreting through a particular perspective then we unwittingly become a slave to the limitations and dangers of that perspective and foreclose on the possibility of deeper and more transformational meaning. Henceforth, anything we can do to become more aware of our interpretive filters and pre-understandings will encourage humility, expand our horizon of understanding, and hopefully evoke fresh insights that will make us more faithful interpreters of the Bible. The best way to do this is to read the Bible in conversation with others, especially those who are different! One important conversation is between the reader and the author(s) of the text. Anyone who has engaged in the academic discipline of Biblical studies knows that the contemporary reader does not have direct access to the original intent and audience of the author. These must be tentatively reconstructed using tools provided by multiple disciplines like archaeology, history, ancient languages, literary and form criticism, and cultural studies. This attempt to determine what an author was trying to communicate to the original audience is the work of exegesis, and (since this is reconstructive work) it too requires interpretation. While historical-criticism does not operate on the basis of certainty, much can be learned about the ancient world, the perspective of the author, the context of the original audience, and the message being communicated. As those who live on the other side of the Enlightenment, the perspective of the author and intended audience will be very different from ours. Acknowledging these important differences allows us to distance ourselves from our own interpretive filters so we can listen to the text on its own terms. While we never do this perfectly (because we cannot completely escape our own perspective), to a certain extent we can resist the urge to blindly project our own modern presuppositions on ancient texts, effectively collapsing the radically different worldviews of the author and contemporary reader. In hermeneutics, this is known as distanciation. We can provisionally bracket our own presuppositions and allow the text to speak to us as a genuine other in ways that will illuminate, challenge, and even change our interpretive filters, as well as broaden our horizon of understanding. In addition, Christians believe that God somehow works through this interpretive conversation with the Bible to speak to us in transformative ways. God can and does speak to us through the kind of scholarly exegesis described above, but God also speaks to us in more devotional readings of scripture, like the ancient practice of lectio divina. Indeed, both of these approaches are important as we seek to understand the Bible and encounter God through it. (See my article, “Shaped By Scripture: Two Different Ways of Reading the Bible.”) As God speaks to us in and through the interaction of our perspective with the Bible, it becomes the Word of God in the power of the Holy Spirit. This encounter with the Word can illuminate, challenge, shape, and even alter our interpretive filters in ways that broaden our horizon of understanding and allow us deeper access to divine truth. This is at least part of the process by which we mature in the faith and grow in wisdom. The more spiritually mature the reader, the more faithful the interpretation. This is why the Bible should also be read in conversation with spiritual directors and teachers who have become wise through contemplation. It is also important to read the Bible in conversation with the larger Christian tradition, both synchronically and diachronically. Gaining more knowledge about how Christians have interpreted the Bible in different ways over the course of 2,000 years will help surface and evolve our interpretive filters, as will contemporary conversations with other Christians around the globe who occupy very different perspectives. We not only ask how Augustine, Aquinas, Luther, and Wesley interpreted the Bible, but also how Christians in Africa, South America, and Asia interpret the text today. We study the history of Christianity but also Latin American Liberation Theology, Black Theology, Feminist and Womanist Theology, and Minjung Theology, all of which confirm the added benefit of conversations with philosophy and critical-theory. One could also argue the benefit of reading in conversation with people of other religious traditions. A great example of this is the interreligious dialogue between Thomas Merton and Thich Nhat Hanh. Again, it should be clear that we don’t have to be slaves to a narrow and shallow interpretive framework. While our reading is always perspectival, our perspective can evolve and deepen over time by disciplined engagement in the various kinds of conversations mentioned above. 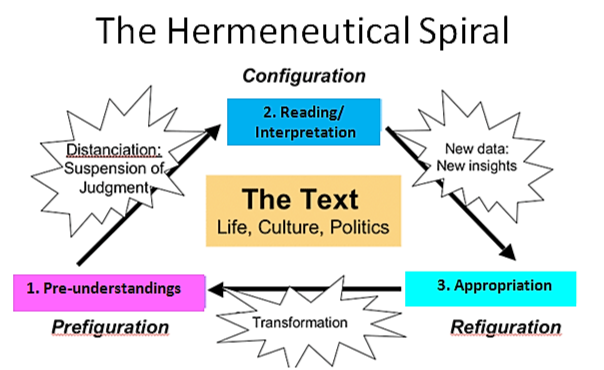 One way of understanding this truth is by reference to the hermeneutical spiral. As you can see in the diagram above, we start with pre-understandings that give us an interpretive framework for understanding the text. As we practice distanciation by bracketing our presuppositions, we allow the text to speak to us as a genuine other in the interpretive process. New insights emerge that are appropriated and assimilated in ways that transform our pre-understandings. In conclusion, the purpose of this article is to destabilize the idea that textual meaning is a neutral, univocal, and static object that is passively waiting to be discovered by a well-intended reader. I am also trying to destabilize the idea of reading as a literal one-to-one correspondence between the human mind and printed words on a page. Taken together, I am criticizing what Merold Westphal calls “cognitive transubstantiation” and emphasizing the importance of interpretive humility. Furthermore, by sharing some key insights in philosophical hermeneutics, we have seen how important it is to be aware of our own perspective and to read sacred texts in conversation with others so that our interpretive filters can evolve and our horizon of understanding can be expanded. The faithful interpretation of scripture is a life-long process, and our hope is that as we continue to grow in this regard that the Bible will continue to be a narrative space where we can encounter the risen Christ and be conformed to his image. There are many different theories that attempt to explain how the Bible came to be. What follows are some informal reflections on the origins of scripture that are consistent with my experience and studies in theology. In his book, Good and Evil, Edward Farley explains that human beings experience redemption in three spheres of existence: the personal, interpersonal, and social. In the personal sphere, we experience redemption as freedom from the dynamics of idolatry and the courage to live by faith. In our relationships with others, we experience redemption as forgiveness, reconciliation, and the freedom to love unconditionally (agape). In the social sphere, we experience redemption as social justice and emancipation from oppressive systems. In these ways, divine redemption breaks into our lives in very concrete and specific ways. As people in the ancient world experienced the freedoms of redemption, some felt inspired by God to theologically reflect on what had happened and to communicate these reflections with others, first through oral tradition then through writing. The people who were obedient to this divine calling spoke and wrote as human beings. This means that they drew on whatever was available to them in their specific cultural-historical context to describe their experiences of the divine. This included their given language, symbol systems, traditions, religious ideas, and communal stories. “The causality exercised by God is not that of a first cause or material cause, which bring about specific, predetermined effects, but that of a final cause, which offers a possibility, an invitation, a goal. God’s creative power also works as a formal cause, providing patterns or ideals for the shaping of events, but not controlling outcomes. Final and formal causes exercise real influence within a framework of contingency, freedom, and indeterminacy. God orders the world, orients it to the attainment of value, but God does not mechanically control the dynamics of the creative process.” (Christian Faith: A Brief Introduction 56). Since there is an ontological distinction between God and the world, and since God does not act with the same kind of agency exercised by human beings, theologians like Martin Luther, Karl Barth, and Paul Tillich emphasize that divine revelation has a paradoxical character. It is not only an unveiling but also a veiling. There is a sense in which God remains hidden even as God is revealed. Taken together, all of this points to the fact that God is a (rational) mystery. To speak of God is to point to a higher rationality, a higher truth, which cannot be exhaustively known by means of human language. As those in the mystical tradition remind us, when we say that God acts, there is a sense in which we don’t know exactly what we mean because there’s not a one-to-one correspondence between the words we use and the events they seek to describe. All theological language is analogy or metaphor. This is the first limitation of our attempts to expression divine redemption. The second limitation has to do with the perspectival nature of human thinking and language. The way that we experience, interpret, understand, and express the “coming forth” of redemption into our lived existence is always already shaped by a particular symbolic-linguistic worldview, which is limited by all of the blind spots and knowledge gaps associated with finite, located, human beings. There is no unmediated or uninterpreted encounter with God. Going back to those in the ancient world who played a role in the shaping of biblical content, it is important to remember that most of the stories of redemption started as oral traditions that were passed down for many years before they were recorded by scribes. As these stories were passed-down from generation to generation they were told and retold, interpreted and reinterpreted, adapted and readapted in ways that met the evolving needs of the worshiping community in an ever changing context. The goal was not to construct a modern historiography, but to engage in ongoing theological interpretation that could help a religious community make sense of God, the world, and the relationship between the two in changing and challenging circumstances. Over time, these oral traditions generated more conceptual thinking about the character of God and God’s relationship to the world. More sustained reflection on the fluid, pliable, theologically interpreted memory of the community functioned to generate theological norms that served in the ongoing adaptation and reinterpretation of the stories (as well as stories and ideas received from other religions). As Walter Brueggemann argues in his book, Theology of the Old Testament, Israel started by attributing verbs to YHWH, then adjectives, and eventually nouns. As the community experienced the redemptive power of God over significant periods of time, they began to see patterns that allowed them to make more general claims about God’s character. All of this gave the community tools for theologically interpreting every aspect of life, which helps us to understand why there are so many different genres in the Bible. As the oral traditions were written and used by the community for various purposes, some of them proved to have enduring value and were collected together as sacred scripture. So the content of the Bible is the community’s theologically interpreted memory of how God acted to save them through a covenant relationship in various ways and in various times and places. While I reflect on biblical authority and inspiration in another article (see “Why the Bible is Important to Christians“), it is appropriate to mention that part of what we mean by “divine inspiration” is that the Holy Spirit was somehow at work in the traditioning process described above. All of this helps us to understand that the Bible is not a book but a library of books. The content constitutive of the Bible was shaped by many different people, who lived in different periods of history, spoke different languages, endorsed different worldviews, wrote in different genres, and addressed different problems and needs in the worshiping community. If you doubt this, simply compare the life and times of Abraham and the Apostle Paul. Some of the books of the Bible have multiple authors and all of them were copied, edited, redacted, and reinterpreted as they circulated among various communities across generations. So the finished product is not a single author book, but a library of books that span the course of centuries. All of this helps us to see that while God is active in the development of the Bible, it is also a very human text. God acts in redemptive ways and inspires people to think and write theologically about these experiences. But God did not write the Bible as John Grisham wrote A Time to Kill. Neither did God negate the humanity of the authors by making them passive secretaries or giving them miraculous knowledge of modern science or historiography. The good news is that God does not need to author a perfect book to accomplish God’s purposes in the world and bring us salvation. Just as God did in Jesus of Nazareth two-thousand years ago, God works in and through the humanity of the biblical authors, with all of their limitations, failures, and blind spots, to ensure that they tell the truth in ways that can lead (in the power of the Holy Spirit) to knowledge of salvation.